Spirit week is the one week of the year that students in every school get to dress up and show their school spirit. 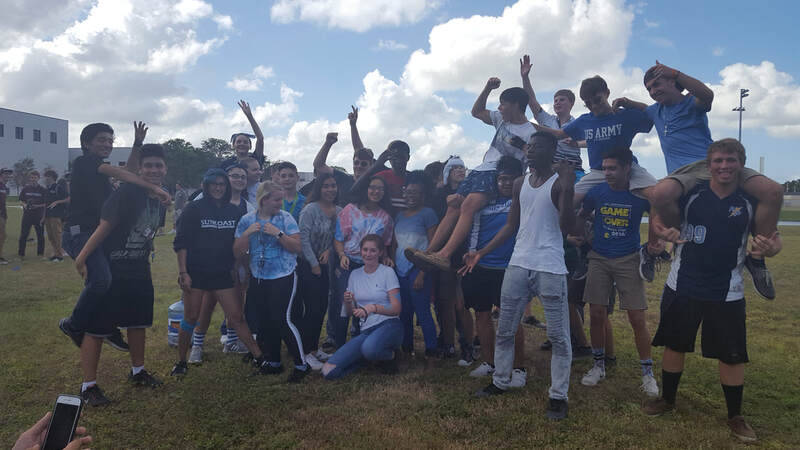 Usually, schools do this during the week of the homecoming dance and the homecoming game, but because Suncoast Polytechnical High School does not have a football team, they show their spirit for games at the end of the week. The games chosen this year were dodgeball and tug-a-war, and every class competed for a chance to win. The freshmen versus the sophomores and the juniors versus the seniors. After the sophomores and the seniors won their game, probably due to the number of participants in each and them both being the older age groups in their competitions, they competed against each other, and the seniors dominated in both games. The votes for dressing up were counted in homeroom and then brought to the office to be counted. Throughout spirit week, there is also a coin war, to see which class can raise the most money. The overall goal of spirit week is to see which class can dress up more and raise the most money to see which class shows most school spirit. Meme day was a day that many were anticipating but unfortunately, it got canceled. Students were excited to take part in Meme day but due to certain circumstances, it couldn’t take place anymore. Meme day was quite controversial as most people did not understand what Memes were. Many students did not enjoy the fact that Meme day was replaced with collegiate day and argued that not many people would participate with Collegiate Day as our school is not that sporty. Numerous students were also talked about still participating for Meme day even though it was canceled; but it did not occur where anyone did dress as a Meme. The cancellation of Meme day left many disappointed since it was promoted for spirit week dress up and students had begun buying accessories for their Meme. Nonetheless, Collegiate day was just as fun and successful. ​ Collegiate Day was a day where everyone wears a piece of clothing related to a college of their choice. Most kids, being that Suncoast Polytechnical High School is right next to and paired with a college, wore their Suncoast Technical College shirts to show spirit for their college. Student M chose to wear the Florida State University Shirt to represent their sister’s school. Student M often visits the FSU campus, that is in Tallahassee, Florida, because their sister attends the college. Student M says they did not see many other people representing FSU probably due to the fact that everyone was representing STC with their shirts. The student feels like the first day of spirit week was a success. ​Day two: Tacky Tourist day. Florida is full of tourists who us Floridians call “snowbirds," who come down to Florida for the winter to escape from the cold weather. Basic tourist stereotypes include bulky cameras, khaki shorts, and Hawaiian t-shirts, which was what the majority of Polytech’s students were wearing. Student N wore a tacky Hawaiian t-shirt and some blue joggers because they still had to honor the uniform for a field trip they were attending. Student N observed many other Hawaiian shirts throughout the day and on their field trip, also noticing that there were an overwhelming amount of Hawaiian shirts on other people, which probably meant that it was tacky tourist day for them too. Student N felt as if this day was a success and also stated that they would vote for this day again because of the large burst in participation. Day three: Wearing Pink for Breast Cancer Awareness. ​ October is national Breast Cancer Awareness Month, and in order to honor it, every year Polytech wears pink on Wednesday. Student V wore a pink shirt and decided to wear pink eye shadow to add to the outfit. Student V noticed a lot of participation on this day, maybe due to the fact that it was an easy day to participate in. They also noticed that there was a lot of face paint because pink is the favorite color of most of the students. This day is part of spirit week every year and thanks to the people who participated in it this year, it shall return next year. ​ Although it does not seem like the most popular day of the week to participate in, there was a large amount of people that participated in Character day. Many people dressed up as characters from movies and shows, and a surprisingly enough, there was a decent number of dinosaurs. Student X dressed up as an animal and noticed that this day was not as popular with the other students compared with the other days. They felt a little embarrassed when they showed up to school to see they were one of the few who chose to participate. Day five: Clash of the Classes. 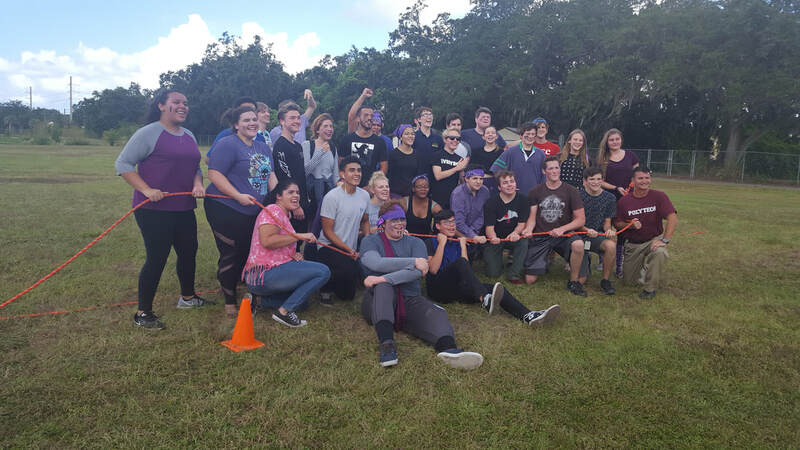 ​ Clash of the Classes is also a favorite among the students because each class gets to compete and students get to see who had the most spirit because they can identify the classes by the colors the students were wearing. Student L wore blue and white to represent the sophomore class and noticed lots of participation. When student L was watching the tug-o-war game, they noticed green and blue because they stood out the most. Student L said that “It was easy to tell who belonged to what class.” They really thought that there was more participation this year than the last. They enjoyed it because it was the one day they knew everyone would dress up to represent their class. This day is also an annual one because of the participation levels being through the roof, with even teacher’s participation. So, the real question is when we asked: “does SPHS have spirit?” Yes, they do!